We talk a lot about transistors in these pages. But usually our discussions center around billions of microscopic transistors acting in concert. This article is not about those. Today, we are going to discuss transistors (and diodes and other components) about the size of your smartphone. These BATs (or “IGBTs” – Insulated-Gate Bipolar Transistors), as the industry seems to insist on calling them) are used in power electronics applications – like electric and hybrid cars, wind and solar power, and that amplifier the kid across the street is building in his basement (the one you’ll be able to hear two states away). Typically, devices in these high-power applications are subjected to large thermal loads and repeated heating/cooling cycles. Also typically, we want them to last a long time. 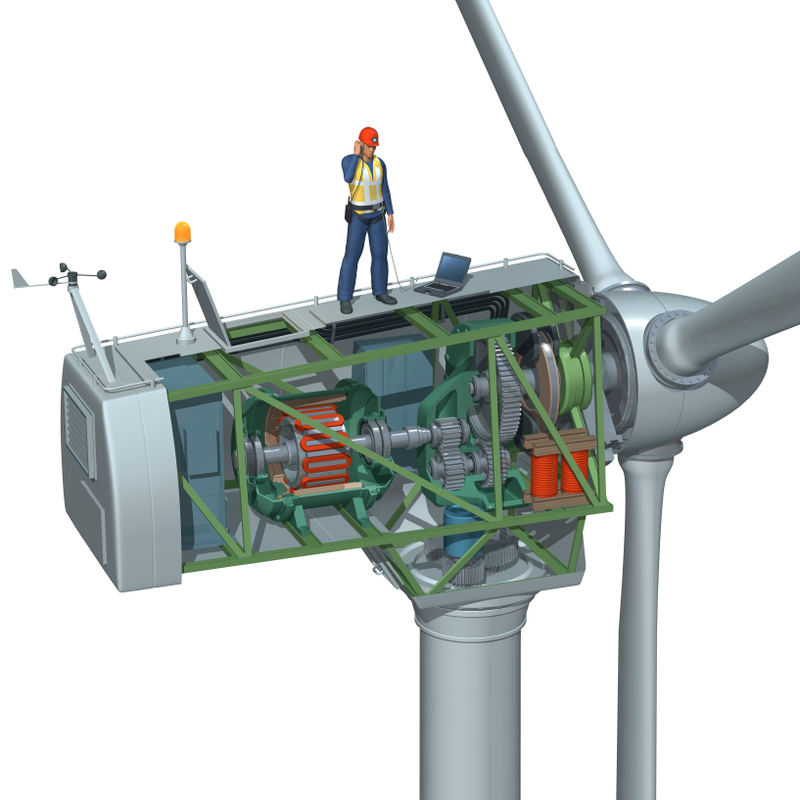 Nobody wants to be climbing up wind turbines every few months to replace power electronic components. Unfortunately, these repeated thermal cycles cause expansion and contraction, which puts mechanical stresses on the components, the substrates, and the connections. When we design a system, we want to have a pretty good idea how well and how long our components will operate – under the conditions we are expecting in our application. These components come with datasheets, of course. But somebody has to make those datasheets in the first place, and sometimes the datasheets don’t describe the conditions under which our particular application will operate. There is a real need for a way to test and characterize the performance, reliability, and durability of power components – without sitting around for twenty years just to see if and when they fail. If you’re designing power electronics, you already know this, of course. And, you’ll be happy to know that Mentor Graphics has just announced the MicReD Power Tester 1500A – which will make your life a whole lot easier. The MicReD 1500A is capable of accelerated testing and characterization of up to three devices in parallel. The total current, as you might have guessed from the name – is 1500A (for a single device under test) or 500A each for three devices. The system is about the size of your washer/dryer, has a simple touch screen interface, and can completely automate the power/thermal cycling and characterization process. You install your devices into the test fixture (on a cold plate), set up the test on the touch screen, press the “go” button, and head to the golf course. As you might expect, the system applies power to the device according to the test program, heating and cooling it while monitoring the thermal reactions to the test. Using conventional methods, these types of stress tests had to be analyzed post-mortem. You ran your device through a few gazillion cycles until it failed. Then, you tried to figure out what went wrong. The challenge with that approach is that diagnosis is not unlike looking at a burned-down building and trying to determine what caused the fire. A lot of forensic investigation is required, and it isn’t a very exact science. MicReD takes advantage of proprietary technology from Flomerics – a company Mentor acquired back in 2008. This technology shortcuts the diagnostic process by catching the device in the act of failing – before it actually fails and (more importantly) before the cascading chain of failures begins (the chain that makes diagnosis of the actual failure mechanism incredibly difficult). In simple terms, the system monitors the thermal response of your device to the power cycles applied by the tester. At some point, those thermal responses will begin to change – signaling an impending failure. This makes diagnosis much easier – you can stop the process, examine the part, and find out what has changed – before the chain of destruction begins. This type of analysis is also useful for locating the source of a failure, as different types of failures exhibit different signatures in thermal response during the tests. The tester is designed to take devices rapidly and automatically through an entire lifetime of power cycles, and to facilitate and accelerate diagnosis of the causes of failure. This is useful for component suppliers working to improve the reliability of their components, and for systems houses using these components to measure their performance under conditions that more closely reflect the intended use case. The system can test a variety of components including MOSFETs, diodes, transistors, and IGBTs. Since power components can be expected to have 30-year lifetimes and endure from tens of thousands to millions of power cycles, accelerated testing is essential. Otherwise, we’d just now be finding out how those devices we designed back in 1984 were doing. The cost, automation, and convenience of Mentor’s Power Tester makes this kind of characterization practical for a much wider range of companies, and it dramatically reduces both the time and expertise required for the testing and characterization process. The Power Tester would be useful for power electronics suppliers wanting to characterize and improve the reliability of their components and packages, and to supply accurate reliability specifications to their customers. Component manufacturers using those parts can also use the system to validate reliability specifications and characterize the reliability of the packaging under more specific conditions. Finally, systems companies producing high-reliability systems using those components can test and characterize those components at the system level, and they can acceptance-test the parts they receive from suppliers. Those familiar with Mentor Graphics may be a bit surprised to find the company in the business of selling test equipment – particularly in the area of power electronics. However, given the current trends toward large, vertically oriented systems companies and towards more integrated systems that span everything from intelligent, connected control to power, those companies – producing everything from cars and trains to solar and wind power solutions – can benefit from the range of Mentor’s products – from custom IC design to PCB to embedded software, and now, characterization of power components. At the same time, in an EDA industry where diversity and product breadth are the best insurance against the ebb and flow of hot and cold tool technologies, establishing a strong presence in areas like power electronics may be a smart move for Mentor. With the current rapid expansion in areas like electric and hybrid cars and alternative energy, there is likely to be overall growth and innovation in power electronics, and this gives Mentor a respectable horse in that race.